Prenzlauer Berg is one of the most popular neighborhoods in Berlin, thoroughly gentrified and the preferred landing pad for young families. Dodge the hordes of baby carriages as you look up, admiring the magnificent architecture, chic shops, and new eateries popping up weekly. Discover the best of this favorite bezirk, including its history, highlights, and how to get there. Founded as its own district in 1920, Prenzlauer Berg is perfect example of the confusion regarding neighborhood divisions. Though this is one of the most well-known areas, it was made part of the Pankow Bezirk in 2001. 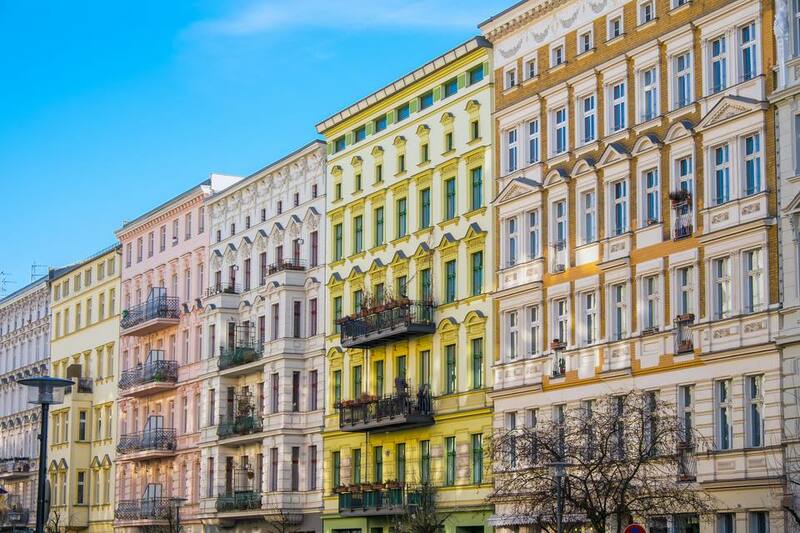 No matter its administrative status, Prenzlauer Berg is among the most popular neighborhoods for its rich history and undeniable beauty. In 1933, the same year the National Socialists seized power in Germany, an estimated 160,000 Jews lived in Berlin which was about one third of the country’s total. Much of the community centered on the Mitte and Prenzlauer Berg neighborhoods with schools, synagogues, and specialty shops. By 1939, World War II had begun and about 236,000 Jews had fled Germany. Under Nazi rule, many of the area's landmarks were re-purposed as temporary concentration camps and interrogation centers like the iconic water tower at Rykestraße. Nevertheless, Prenzlauer Berg survived WWII with over 80% of its elegant Wilhelmine altbaus (old buildings) still intact. It was left largely unchanged after the city was divided and it was ceded to the Soviet Sector. During this time, many members of East Germany's counterculture made a home in Prenzlauer Berg. Bohemians and artists enlivened this area and were an important part of the peaceful revolution that brought about the fall of the Wall in 1989. A coat of paint and rapid gentrification has changed it from a Jewish enclave to a place full of squatters and artists to one of the richest areas in Berlin. The Bohemians have settled into yuppiedom and now rule the streets with baby strollers rather than fixies. The good news is that the area is beautifully restored with some of the most picturesque streets in all of Berlin. Organic ice cream shops, kindercafes (children cafes) and playgrounds sit on every corner. The streets of Kollwitzplatz and along Kastanienallee are particularly desirable. Mauerpark: This park fills a space where the Berlin Wall once ran. On Sundays, visitors overrun the space for the most popular flea market in the city. Walk along a remnant of the Berlin Wall constantly being re-worked in new graffiti or test out your rock star skills for Bearpit Karaoke. Oderberger Strasse: This picturesque street is like an extension off the park. The same chill vibe pervades past the many cafes, second-hand shops, and restaurants lined by some of the prettiest architecture in all of the city. Berlin Wall Memorial: The Gedenkstätte Berliner Mauer at Bernauer continues to expand and improve, year after year. Depictions of daring tunnel escapes, destroyed churches, and the history of constructing a wall right down the middle of the capital city lead down the Mauer Weg (empty area where the wall once ran) to the museum. Here, visitors can view news reels that relive the horrifying events on repeat and climb up to a viewing platform that shows what the death strip actually looked like. Kulturbraurei: Once a large brewery, this brick complex now hosts a cinema, grocery store, theater, several clubs, restaurants, art studios, and even a GDR museum. In addition, it plays host to an array of special events like Lucia Weihnachtsmarkt, one of the best Christmas markets in Berlin. Kastanienallee: This picturesque street, named for the chestnut trees that line either side, connects Prenzlauer Berg with Mitte. The oldest biergarten in the city, Prater, also has a home here. Rykestrasse Synagogue: The largest synagogue in Germany is in Berlin. Founded in 1903, it barely escaped destruction from the Nazis during the pogrom in 1938, but was desecrated in April 1940. After the war, it underwent several renovations and was re-opened in all of its glory for its 100th anniversary. The nearby Jüdischer Friedhof Prenzlauer Berg (Jewish Cemetery) on Schönhauser Allee is another essential site for those on a pilgrimage. Opened in 1827, there are more than 22,500 plots with notable residents like Max Liebermann, Giacomo Meyerbeer, and many more. Volkspark Friedrichshain: The oldest public park in Berlin borders Prenzlauer Berg and Friedrichshain. Its sprawling grounds have something for everyone from volleyball courts to grill areas to the Marchenbrünnen (fairy tale fountain). Maria Bonita: For those desperately in search of Mexican food in Berlin, this hole-in-the-wall taqueria is the answer. Colorful decor, homemade tortillas, and legit hot sauce add spice to your Berlin life. Konnopke's Imbiss: For a more traditional Berlin bite, this well-established currywurst stand beneath Eberswalder U-Bahn is an institution. It has been serving some of the best wurst in the city since 1930. Gethsemane Church: This centerpiece church of Helmholtz-Kiez was a meeting place for the resistance during the wende (peaceful revolution) in the former German Democratic Republic during the late 1980s. On the 40th anniversary of the foundation of East Germany, the church kept its doors unlocked day and night for public discussion and as an escape from arrest from the police and secret Stasi units. This was of particular use on November 5th, 1989 when senior musical director of the Komische Oper, Rolf Reuter, cried “The wall must go!”, leading to a spontaneous demonstration along Schönhauser Allee. Today, the church still holds services and is open to visitors. Water Tower: A signature landmark in a neighborhood of iconic buildings, the water tower at Kollwitzplatz has a storied history. Completed in 1877, it is Berlin’s oldest remaining water tower and has served a variety of purposes from soup kitchen to fish processing to one of the first "wild" concentration camps to today's luxury apartments. Kollwitzplatz: Surrounding the water tower is the trendy area of Kollwitzplatz. The epitome of Prenzlauer Berg living, it is packed with idyllic apartments, shady playgrounds, and cafes for kinder and their folks. There is also an organic farmers market twice a week so there is no need to ever leave. For a bit of history, refer to the statue of Käthe Kollwitz who called the neighborhood home in the early 1900s. The Bird: This American mainstay is a meeting point for English-speakers, and one of the best places to get a burger and good service in the entire city. The rest of Pankow stretches north past Weißensee (also once its own neighborhood and incorporated at the same time as Prenzlauer Berg) all the way to Buch at the outer edge of Berlin. It is largely residential with many parks and green spaces. As more and more people are priced out of Prenzlauer Berg, they are finding a new home in Pankow outside the ring. As with most of Berlin, the neighborhood of Prenzlauer Berg is well-connected with the rest of the city by U-Bahn, S-Bahn, bus, tram, and roadway. It is about 30 minutes from Tegel Airport, 35 minutes from Schonefield and 18 minutes from the Hauptbahnhof (main train station).